THINK OF CHOCOLATE and you think of… what? Do you immed-iately think of the softly melting flavour of Cadbury's? Comfort eating where any old bar will do? Or are your tastes more refined? Associated with romance, chocolate is one of the best selling treats and it is often given as a token of affection. It was discovered by the Mesoamerican civilisation and used in a variety of drinks and sauces by the ancient Mayans and Aztecs  the drink was very bitter, unlike the chocolate drinks we know today. 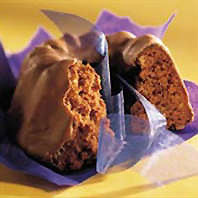 Chocolate is made from the seeds of the Theobroma cacao, a tree revered by the Aztecs, to whom the beans were currency. The word 'Theobroma' is Greek, and means 'Food of the Gods'. We'd go along with that. In the Sixteenth Century, chocolate was brought back to Europe by explorers and, once sweetened, became a fashionable luxury. The first chocolate factory was established in Spain, in 1580. Columbus had come back from the West Indies with chocolate, but it was the conqueror of Mexico, Fernando Cortez, who first brought the secret of cocoa and chocolate to Europe earlier in the 16th Century. It was a closely guarded secret at the Spanish Court for almost one hundred years, but eventually it arrived in France and then appeared in England. By the 17th Century, chocolate houses  where you could also get tea and coffee  were thriving in London for dedicated followers of fashion. The first chocolate bars were available by the 1800s and Coenrad van Houten, a Dutchman, had perfected the extraction of cocoa butter from the bean by the early 1820s. Towards the end of the 1800s, the Swiss Rudolphe Lindt was adding extra cocoa butter to his chocolate recipe, which made it much smoother and more palatable. A few years earlier, fellow Swiss Daniel Peter had used a new product  Nestle's condensed milk  to perfect milk chocolate. The industrial revolution and mechanical age was to lead to the larger scale manufacture of chocolate. to hot chocolate as we can regulate the sweetness. We highly recommend the intense flavour of Van Houten cocoa powder  scrumptiously yummy! In 1824, John Cadbury opened a shop selling tea, coffee, drinking chocolate and cocoa in Birmingham, in the UK. He went on to manufacture drinking chocolate and cocoa and went into partnership with his brother, Benjamin. Thirty years later, Cadbury's received a Royal Warrant as purveyors of chocolate to Queen Victoria and John's sons, Richard and George, took over the business in 1861 when their father retired. loved chocolate in the UK and tours of the Bournville factory are available  go to Cadbury's websites at www.cadburyworld.co.uk or www.cadbury.co.uk and you will find a taster of what's in store for you there. By the Second World War, the quality of chocolate had improved and prices were coming down to match demand. Chocolate was becoming popular with the masses, but rationing during the war meant it wasn't readily available. When the Americans arrived, it was a case of over paid, oversexed, over here and hand over the chocolate! earn a few Chocolate Brownie points, Divine fair trade chocolate is widely available. Go to www.divinechocolate.com. Prima Chocolate Fondue Fountain at £49.95; Sephra Chocolate Fondue Fountain at £89.95 and Sephra Classic Chocolate Fondue Fountain at £119. Or go to www.firebox.com where there is a choice of two models, standard and deluxe, at £29.95 and £49.95 respectively. No self-respecting chocoholic could be satisfied until they had visited The Chocolate Society at www.chocolate.co.uk. Established in 1991, The Chocolate Society was founded 'to promote the consumption and pure enjoyment of the finest quality chocolates'. The site is easy to navigate and gives you the background history of the society, opportunities for home shopping, recipes and details about their shops. The shop at Elizabeth Street, London, SW1, serves good quality tea and coffee and superb hot chocolate with '40g of pure chocolate per cup'. There is also a 'Did You Know' section with chocolate facts, including that fine chocolate can actually help lower your cholesterol. It also contains a useful tip: Chocolate contains phenyl ethylamine, an amino acid which has aphrodisiac properties and is also good for helping to ease a hangover. limited selection from their range. and the union has proved successful. 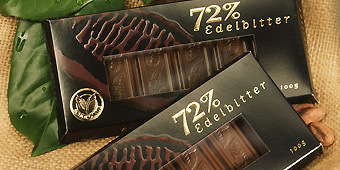 If you want to try more of their recipes, visit the site and go to Chocophilia, then to Recipes, where  as well as the recipes below  you will find an interesting selection of both well-known and unusual ideas, including Bass in Coarse Sea Salt with Bitter Chocolate. Chocolate Sauces  in under a minute! Preparation  Grease a 23-cm diameter baking tin (with an opening ring) with the butter and cover the bottom with greaseproof baking paper. Pre-heat the oven to 150°C. In the meantime, mix the brown sugar together with the butter in a large bowl. Beat the egg yolks into the mixture one at a time. Break the chocolate into pieces and mix into the egg mixture together with the ground almonds. Continue mixing until you have a smooth mixture. Then beat the egg whites together with 2.5 tablespoons of sugar. Carefully fold the egg whites into the chocolate mixture in four separate parts and mix in gently. Take care not to mix it brusquely so that you ensure the mixture retains its volume. Pour the mix into the baking tin and bake the cake for 50 minutes until it becomes slightly rounded in the middle. Leave it to cool down completely before you remove the baking tin. 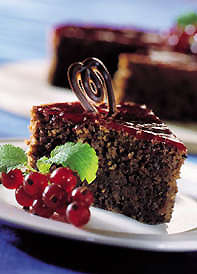 Then spread a thin layer of red berry jelly on the top of the cake and finish off with a few chocolate decorations or some icing sugar. whip up 300 grams of whipping cream until stiff together with two tablespoons of icing sugar and a few drops of vanilla essence. Preparation  Melt the butter and add the sugar. Blend in the lightly beaten eggs, the nuts, melted chocolate, vanilla, flour and, lastly, the salt. Blend into an airy cake mix. Pour into a circular cake tin and bake for 50 minutes at 200°C. Then, let the cake cool on a stand. Brush with apricot preserve, then pour a light icing glaze over the cakes, allowing it to drip and set. Break the dark chocolate into pieces and melt in a bain-marie or in the microwave oven (at 750W and remember to stir every 5 to 10 seconds to avoid the chocolate to burn). 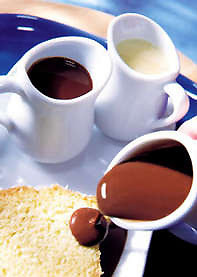 Then mix the sugar and the strong coffee or the instant coffee together with the melted chocolate and beat well. If you use a bain-marie, remove the receptacle from the bain-marie and only then should you mix the egg yolks into the chocolate mixture one at a time. Beat the egg whites with a pinch of salt. Beat the cream (not too stiff) and gently fold the egg white mixture into the chocolate mixture a bit at a time. Finish by mixing in the cream. 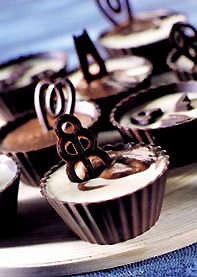 Pour the mousse into eight chocolate cups and leave to set for at least two hours in the fridge. Finish off with decoration elements or royal chocolate shavings. Tip  How to make chocolate shavings? Grate a piece of chocolate across the coarser side of a grater or use a good clean and cold vegetable peeler. Preparation  Depending on the sort of sauce that you want to prepare, you can select dark chocolate drops or choose milk or white chocolate that you should break into pieces. Put the chocolate together with one tablespoon of milk (or cream for a soft and creamy sauce) into a small jug. Place for 15 seconds in the microwave oven at 650W, stir well, heat for a further seven seconds in the microwave, stir one more last time  and it's ready! This is how you can whip up a delicious and fresh chocolate sauce in seconds to serve at table. Delicious on ice cream coupes, red fruits, banana slices, pancakes or waffles. Preparation  Melt the chocolate and mix with the milk. Add the liqueur and mix. Chill (to just above freezing point). Preparation  Boil down the pieces of pineapple with the juice from the passion fruit and the sugar. Mix and sieve. Finishing and presentation  Blend the ice cold 'chocolate milk' until it doubles in volume. Pour into tall glasses. Pour the very hot pineapple sauce into the middle. Drink immediately. Preparation  Heat the cream right through with the trimoline. Pour this mixture on the chocolate that has been cut to pieces and mix this well. Then stir the beaten yolks in with the mixture. Spread this out in a stainless steel tray of 38 x 38 cm and let it harden for one night. Finishing and presentation  Once it has hardened, cut the filling in the tray into small rectangles (1.5 x 3 cm). Dip them in tempered dark chocolate.